White pumpkins, mixed metallics, and fresh greenery creates a beautiful Thanksgiving tablescape. 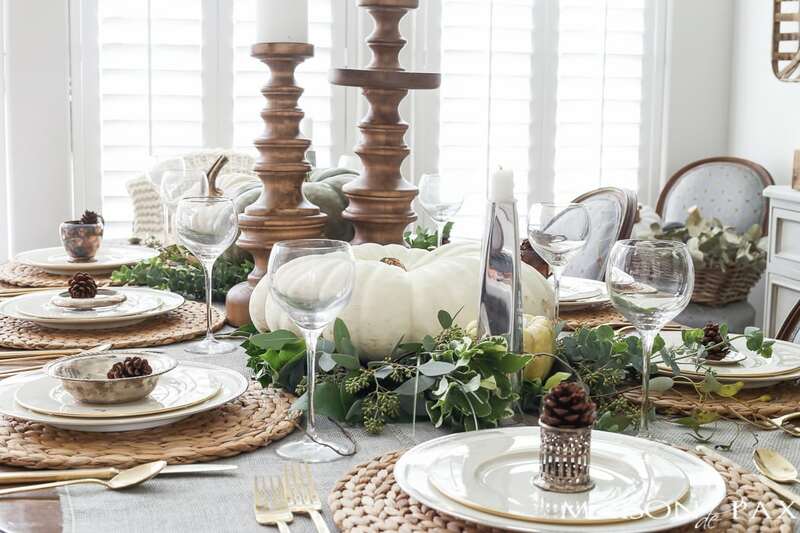 Learn how to create your own elegant, neutral Thanksgiving table decor! I can’t believe it’s almost November! I’m feeling especially blessed this year as some family from the East Coast whom we don’t get to see very often is making their way down to Texas for the week of Thanksgiving… I can’t wait. 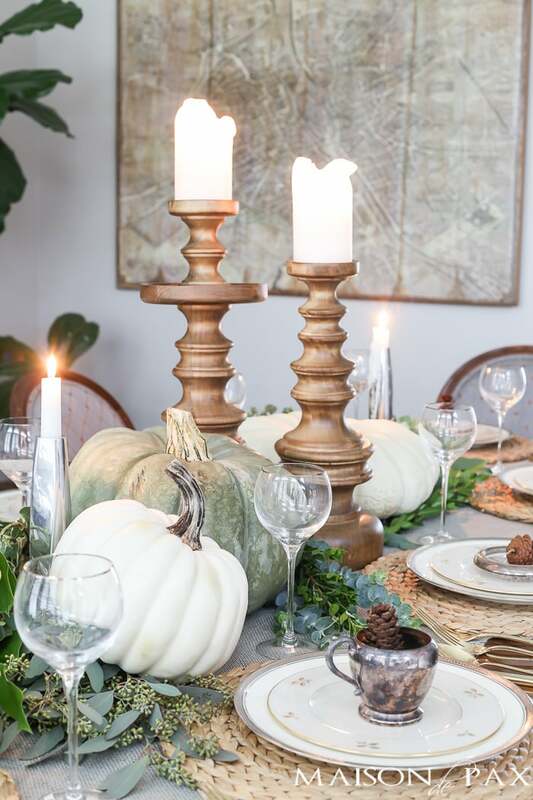 And while I’m not even hosting Thanksgiving this year, it was so so fun to put together this beautiful tablescape for you all as inspiration. And who knows, I’ll probably be given the job of decorating the table at my mom’s house anyway. 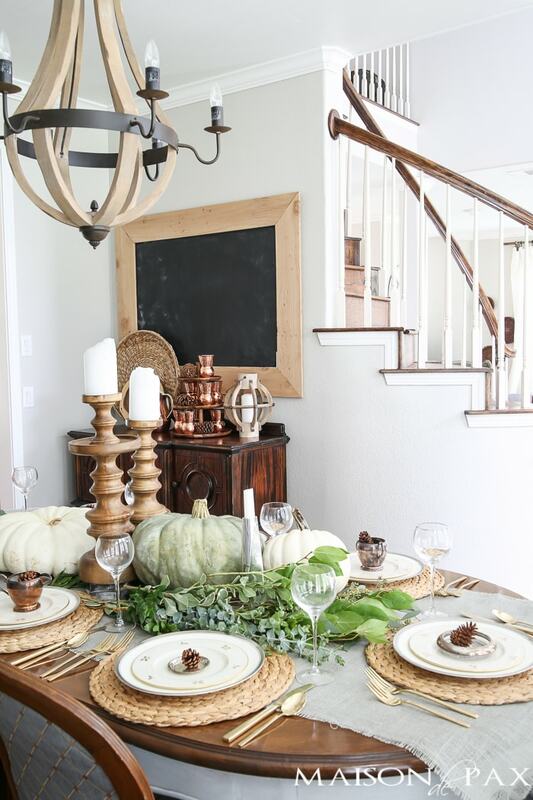 I’m so happy to be sharing this as part of the Holiday Entertaining Blog Tours put together by my sweet friend Lory from Designthusiasm. If you are hosting Thanksgiving, I know you have so many things to think about: turkey, gravy, drinks, music, keeping crystal out of reach of the little ones, keeping the feuding family members as far apart as possible… 😉 Just being real here, friends. I’m hoping, though, that today’s little post will take one of the responsibilities off your plate. 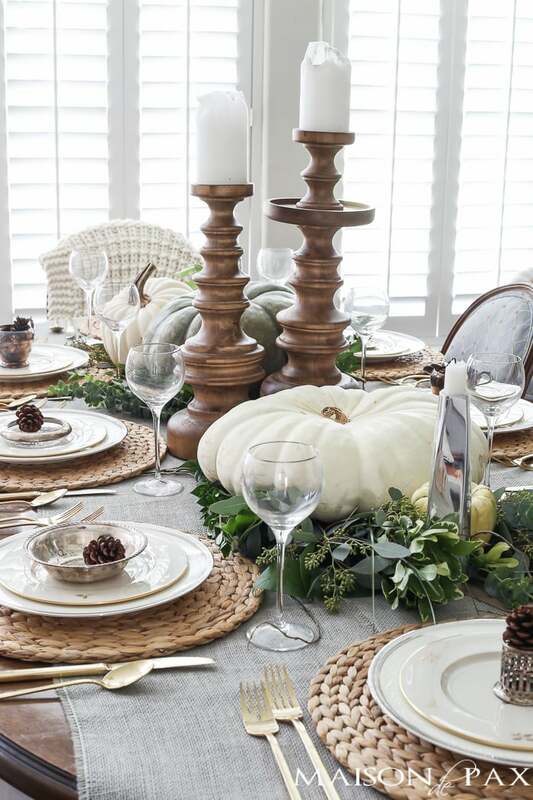 Today’s post is all about HOW to create a gorgeous tablescape SIMPLY. It’s Thanksgiving… it’s a pleasure to have an elegant table and to celebrate God’s goodness, but you don’t need it to be complicated, right? Here’s a little video giving you all my best tips for creating a beautiful table. And now, here are some more pretty pictures of this space… because we all like a little eye candy, right? Now be sure to visit the other ladies sharing their holiday entertaining ideas. Gorgeous! Such great eye candy. 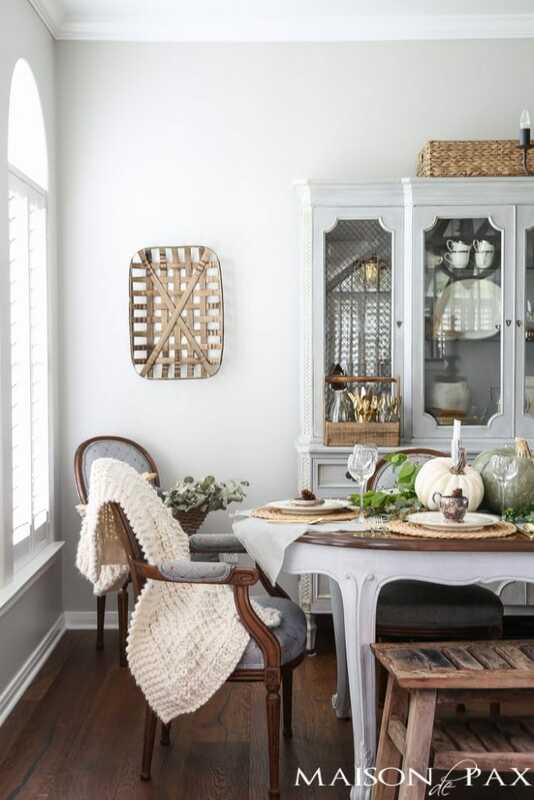 I always love your decorating style. Is my computer messing up or is the video tutorial missing? Your table is exactly as you hoped – simply beautiful! 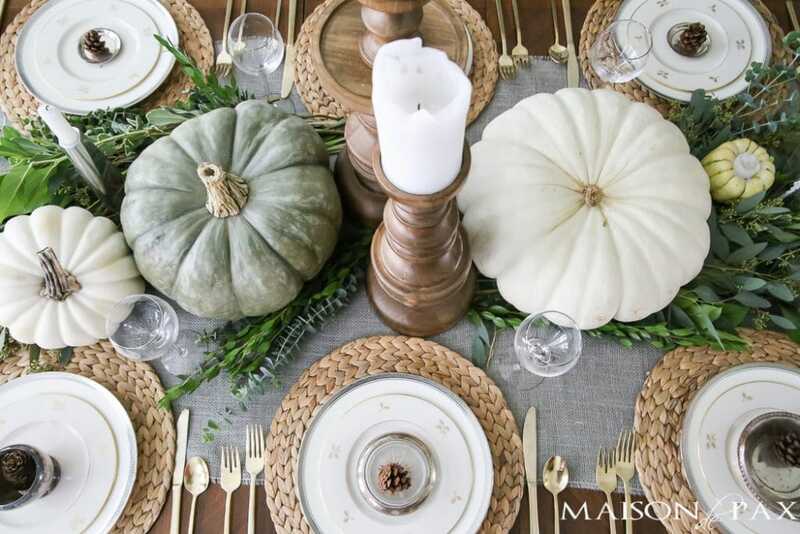 I love the use of heirloom pumpkins and greenery, as well as the unique vintage silver at each place setting. It’s just delightful! I love your gorgeous table!!! Everything is so lovely, Rachel!! Absolutely beautiful Rachel! I love how cozy the chunky throw makes the room look! This is so beautiful and elegant, Rachel! 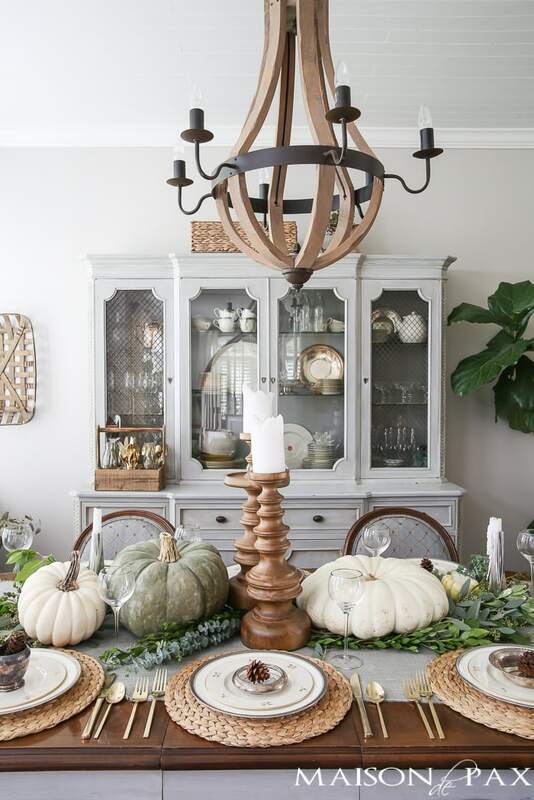 I love your pumpkins so much and your dining room is just gorgeous! You never disappoint, Rachel. Love the video! Gorgeous job as always, friend! Rachel, I love your table and I love your video! So perfect! You are so sweet, Kelley, thank you! I hope you have a very happy Thanksgiving. 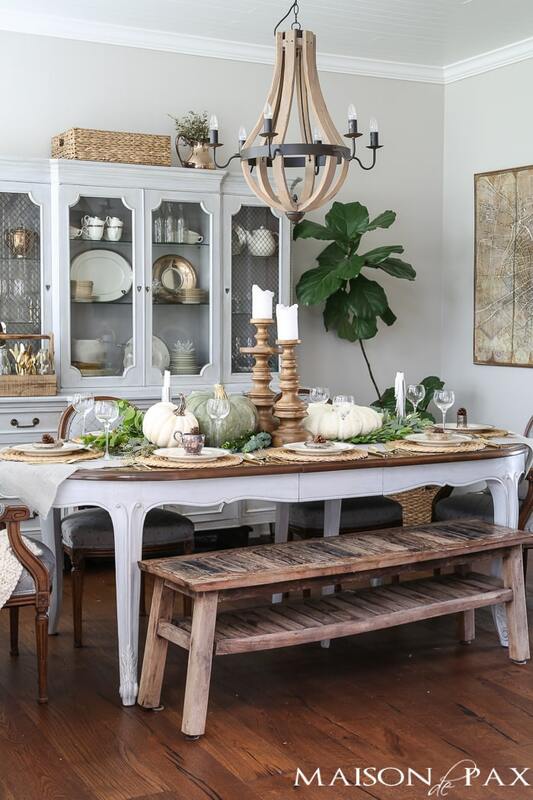 That is just beautiful….the perfect blend of elegance with a rustic vibe. Love every detail…..thanks for sharing! I always love how you set a table Rachel! Your plates look similar to mine and I’m curious as to know what they are? Hugs friend. All the textures are amazing Rachel…I love all the natural elements too. I’m definitely in love with the seeded eucalyptus! Thank you so much, Fabiana! 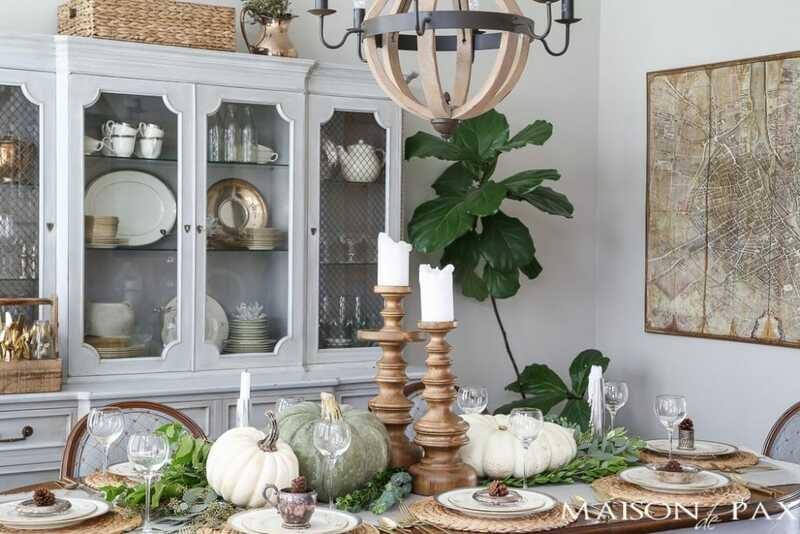 The pumpkins and greenery are very appealing and lovely. The whole table is just beautiful. But I didn’t see any napkins or flatware–did I just miss them or you decided not to include them? I love your table! Simply gorgeous! May I ask- what is your white with silver (/platinum) trim? I saw it on your plates and the teacups in the china cabinet? They are beautiful. Happy, happy Thanksgiving to you and your family! Thank you so much! It’s Noritake, and it’s just like this one (affiliate link), except it’s off white. I haven’t found it online (ours was purchased 15 years ago; maybe they don’t make it anymore??). I hope this helps!